“Your children are so well-behaved,” says the woman in the pew behind us. “We enjoy sitting near your family in Mass,” reports an older couple. My husband and I hear these kinds of comments frequently. But before you judge me a braggart and quit reading, let me say that it has taken a lot of hard work (and maybe a bit of blood, sweat and tears) to make parenting look easy inside of the pew. 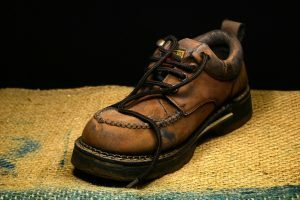 From the early morning battles to wake a sleepy head to the perpetually missing church shoe, we know first-hand the real life struggles involved in loading 10 individuals into a maxi-van by 8am on Sunday morning. Additionally, there’s the antsy toddler and small-bladdered, elementary schooler to contend with during the gospel. Truly, with 8 (strong) personalities in our care, you have to know that we fully understand the challenge of getting to and sitting in Mass every week. However, my husband and I determined from the start of this wild adventure in parenting that we would do whatever it took to attend Mass as a family. Of course, our motivation to train our children wasn’t really to make the Mister and me look good. We knew that attending Mass together benefited all of us. As the 1994 Swiss survey documented, the religious practice of the father decides the future attendance habits (or absence) of the children. Though we didn’t actually have that statistical proof when we began toting our babies to Mass more than twenty years ago, we knew that it made sense for us to present a united front to our children. Wanting to attend Mass as a family, my husband and I developed training strategies to achieve our goal. We established rules that both gave our children clear guidelines to follow and gave us a unified plan for co-parenting in the pew. When our oldest children were still tots we offered them limited, silent distractors like a couple of Cheerios in the hand or a plush, noise-less toy to hold. 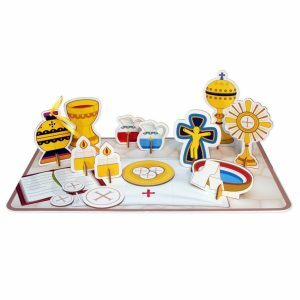 We recognized that little ones occasionally needed something to keep their hands busy during the course of the Mass, but we didn’t want to turn the pew into a cafeteria or inhibit those around us from being able to hear over a jingly toy. Once our children reached pre-school age we stopped providing all distractors because by 3 or 4 years old they were capable of sitting still (relatively speaking) without them. If you doubt me on that, consider how well a pre-schooler can sit through his favorite episode of Paw Patrol. We save discussions for outside of the sanctuary; that includes explanations about what is happening, commentary on who is sitting near us and queries about getting donuts after Mass. Typically, with children, questions during Mass have less to do with an immediate need for information and more to do with breaking up the silence. Even the best child occasionally pushes the limits and must be removed from the sanctuary. Whether it’s a screaming baby, a noisy toddler or a rambunctious pre-schooler, sometimes a child must be taken out for the sake of the rest of the parishioners. In our family when that happens with a small child (small enough to be held) we take the child out and hold them. We do not allow them to roam. If the child is too big to be held, then they stand with their nose to a wall. The point of this rule is that we want it to be more pleasant to stay in Mass then to be in the narthex or a cry room. We’ve found that if you implement this rule while they are young, they rarely need to be removed after their toddler years (but it is never too late to add this one in). Obviously, human nature means that we sometimes need a bathroom break at a less than convenient moment; however, potty breaks during Mass should be a rare occurrence. 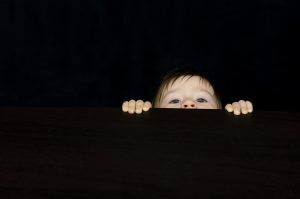 Without a clear consequence, children can develop a habit of feeling the urge to go on a fairly consistent basis (like just as the homily begins). We wanted to allow our children the option of potty breaks when they were really necessary, while at the same time giving them incentive to police their own bladders. So, we established the standing rule: if you leave Mass for a bathroom break, you forfeit dessert that evening (our kids are highly motivated by a cookie). Amazingly (not really), once we set the rule in stone our children stopped requesting to visit the commode mid-Mass. 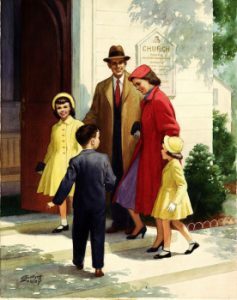 To increase their rate of success, I always parade our younger children to the restroom before the service begins. n the early years, we sat in the middle of the church. We thought the distance from the altar gave us a buffer zone (or at least helped us save face with Father). Then somewhere along the line we were encouraged to position our family up front. When the children had a clear view of what was happening (as opposed to staring at the back of someone’s head), they fussed and fidgeted less. Since cry rooms separate children from the reverence of the sanctuary, we avoid them unless absolutely necessary. In addition to sitting up front, we make a habit of developing a relationship with our priest and deacon. This way the children feel connected as part of the Body of Christ and they are more interested in watching Father celebrate the Mass. We encourage free play of Mass at home. We don’t get overly concerned with the gender roles, but we do explain why it is that only men can be priests (and altar servers in some parishes). All of my children at one time or another have role-played Mass. They take turns being the altar servers, priest, lector, etc. There are several lovely Mass kits made specifically for child’s play (from the simple to the Lego-inspired). My own children turn mops into crosses, animal crackers into hosts and our coffee table into an altar. Taking children to Mass can definitely be a challenge. To be fair, for families with special needs the challenges may require more creative solutions. But even still, when the whole family makes Holy Mass a priority right from the start, children learn more quickly how to behave reverently. Bringing children to Mass every week is the surest way to teach them that faith is foremost. Heed the call, lead your children to Jesus. Do you have any tried-and-true strategies for training little ones for Mass? 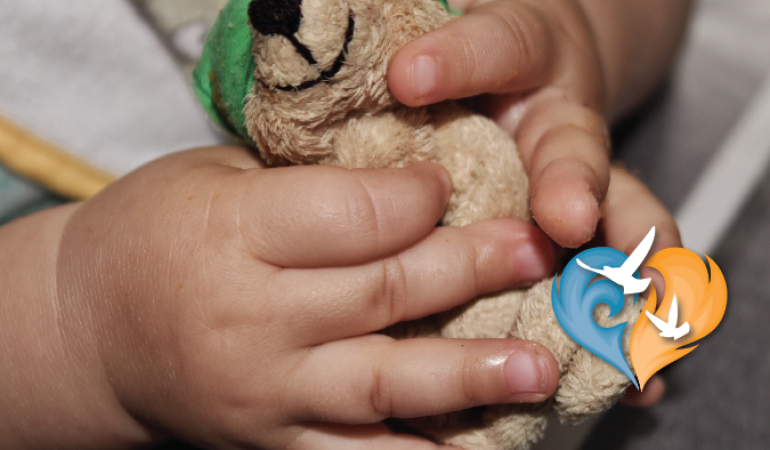 Does your family have a creative solution for helping a child with special needs to practice reverence? I think I’ll have to try the string! So simple and easy. I attend mass with my daughter and 3 granddaughters, ages 3, 4 and 7; I use basic sign language to encourage silence. Although I’m communicating, I use signs for: church, pray, pastor speaking, sing and cross. It has helped keep them focused and learning sign language in general. I will never encourage food in church. W e fast before mass, so food is a distraction for us (even cheerios).